This web site outlines the major problems with thrillcraft use of our public lands. We hope it will be a reference point that activists will return to periodically to find the latest information about thrillcraft impacts, successful strategies used to limit thrillcraft destruction, as well as inspiration to carry on the effort to control and limit these machines and the culture that spawns this use. 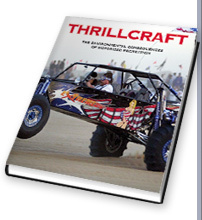 Thrillcraft use has risen dramatically since the 1960s. A Forest Service report estimates that 42 million ORV users between 2003 and 2004. Since that time, the number of users has increased to the point where former Chief of the Forest Service Dale Bosworth called Thrillcraft one of the four major threats to national forest lands. Worse yet, machines are increasing in power and mechanical ability enabling them to reach ever more remote lands. Thrillcraft users are turning our national pride in a national tragedy. 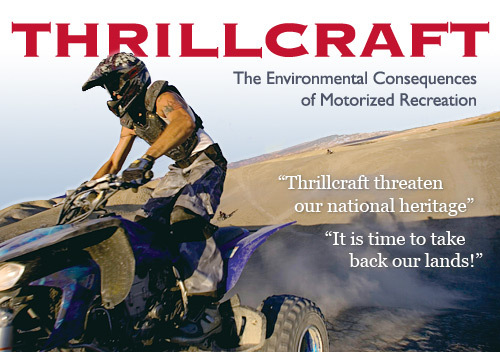 Thrillcraft threaten our national heritage. It is time to take back our lands! Published . . . . . Distributed . . . . .
Edited by . . . . .